The annual Grand Canyon monsoon is known for its spectacular electrical storms, but let’s not forget the rainbows that often punctuate these storms. A rainbow requires rain, sunlight, and the right viewing angle—given the ephemeral nature of a monsoon thunderstorm, it’s usually safe to assume that the sun probably isn’t far behind. To experience a rainbow after a Grand Canyon monsoon storm, all it takes is some basic knowledge, a little faith, and some good fortune. To help with the knowledge part, I’m sharing the how-and-why of rainbows, excerpted from my just updated Rainbow article in my Photo Tips section. For the faith and good fortune part, read “The story of this image” at the bottom of this post. Most people understand that a rainbow is light spread into various colors by airborne water drops. Though a rainbow can seem like a random, unpredictable phenomenon, the natural laws governing rainbow are actually quite specific and predictable, and understanding these laws can help photographers anticipate a rainbow and enhance its capture. Energy generated by the sun bathes Earth in continuous electromagnetic radiation, its wavelengths ranging from extremely short to extremely long (and every wavelength in between). Among the broad spectrum of electromagnetic solar energy we receive are ultra-violet rays that burn our skin, infrared waves that warm our atmosphere, and a very narrow range of wavelengths the human eye sees. These visible wavelengths are captured by our eyes and interpreted by our brain. When our eyes take in light comprised of the full range of visible wavelengths, we perceive it as white (colorless) light. Color registers when some wavelengths are more prevalent than others. For example, when light strikes an opaque (solid) object such as a tree or rock, some of its wavelengths are absorbed; the wavelengths not absorbed are scattered (reflected). Our eyes capture this scattered light, send the information to our brains, which interprets it as a color. When light strikes water, some is absorbed, some passes through to reveal the submerged world, and some light is reflected by the surface as a reflection. Light traveling from one medium to another (e.g., from air into water) refracts (bends). Different wavelengths refract different amounts, causing the light to split into its component colors. To understand the interaction of water and light that creates a rainbow, it’s simplest to visualize what happens when sunlight strikes a single drop. Light entering a water drop refracts (bends), with different wavelengths refracting different amounts, which separates the originally homogeneous white light into the myriad colors of the spectrum. But simply separating the light into its component colors isn’t enough to create a rainbow—if it were, we’d see a rainbow whenever light strikes water. 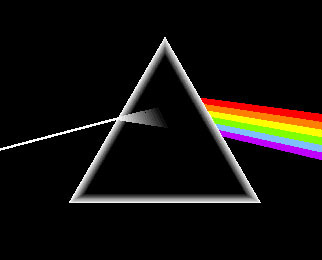 Seeing the rainbow spectrum caused by refracted light requires that the refracted light be returned to our eyes somehow. A raindrop isn’t flat like a sheet of paper, it’s spherical, like a ball. Light that was refracted (and separated into multiple colors) as it entered the front of the raindrop, continues through to the back of the raindrop, where some is reflected. Red light reflects back at about 42 degrees, violet light reflects back at about 40 degrees, and the other spectral colors reflect back between 42 and 40 degrees. What we perceive as a rainbow is this reflection of the refracted light—notice how the top color of the primary rainbow is always red, the longest visible wavelength; the bottom color is always violet, the shortest visible wavelength. Every raindrop struck by sunlight creates a rainbow. But just as the reflection of a mountain peak on the surface of a lake is visible only when viewed from the angle the reflection bounces off the lake’s surface, a rainbow is visible only when you’re aligned with the 40-42 degree angle at which the raindrop reflects the spectrum of rainbow colors. Because the anti-solar point is always at the center of the rainbow’s arc, a rainbow will always appear exactly opposite the sun (the sun will always be at your back). It helps to remember that your shadow always points toward the anti-solar point. So when you find yourself in direct sunlight and rain, locating a rainbow is as simple as following your shadow and looking skyward—if there’s no rainbow, the sun’s probably too high. Sometimes a rainbow appears as a majestic half-circle, arcing high above the distant terrain; other times it’s merely a small circle segment hugging the horizon. As with the direction of the rainbow, there’s nothing mysterious about its varying height. Remember, every rainbow would form a full circle if the horizon didn’t get in the way, so the amount of the rainbow’s circle you see (and therefore its height) depends on where the rainbow’s arc intersects the horizon. While the center of the rainbow is always in the direction of the anti-solar point, the height of the rainbow is determined by the height of the anti-solar point, which will always be exactly the same number of degrees below the horizon as the sun is above the horizon. It helps to imagine the line connecting the sun and the anti-solar point as a fulcrum, with you as the pivot—picture yourself in the center of a teeter-totter: as one seat rises above you, the other drops below you. That means the lower the sun, the more of its circle you see and the higher it appears above the horizon; conversely, the higher the sun, the less of its circle is above the horizon and the flatter (and lower) the rainbow will appear. 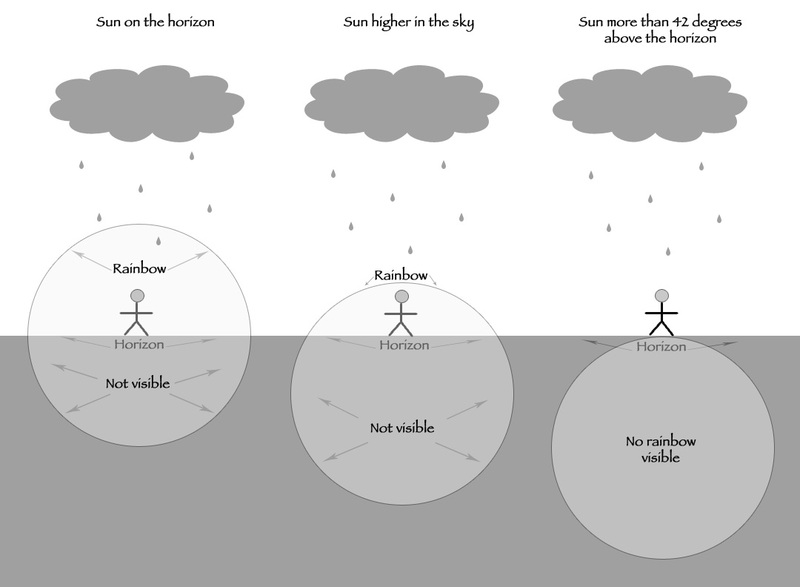 Assuming a flat, unobstructed scene (such as the ocean), when the sun is on the horizon, so is the anti-solar point (in the opposite direction), and half of the rainbow’s 360 degree circumference will be visible. But as the sun rises, the anti-solar point drops—when the sun is more than 42 degrees above the horizon, the anti-solar point is more than 42 degrees below the horizon, and the only way you’ll see a rainbow is from a perspective above the surrounding landscape (such as on a mountaintop or on a canyon rim). Of course landscapes are rarely flat. Viewing a scene from above, such as from atop Mauna Kea or from the rim of the Grand Canyon, can reveal more than half of the rainbow’s circle. From an airplane, with the sun directly overhead, all of the rainbow’s circle can be seen, with the plane’s shadow in the middle. Not all of the light careening about a raindrop goes into forming the primary rainbow. Some of the light slips out the back of the raindrop to illuminate the sky, and some is reflected inside the raindrop a second time. The refracted light that reflects a second time before exiting creates a secondary, fainter rainbow skewed 50 degrees from the anti-solar point. Since this is a reflection, the colors of the secondary rainbow are reversed from the primary rainbow. And if the sky between the primary and secondary rainbows appears darker than the surrounding sky, you’ve found “Alexander’s band.” It’s caused by all the light machinations I just described—instead of all the sunlight simply passing through the raindrops to illuminate the sky, some of the light was intercepted, refracted, and reflected by the raindrops to form our two rainbows, leaving less light for the sky between the rainbows. 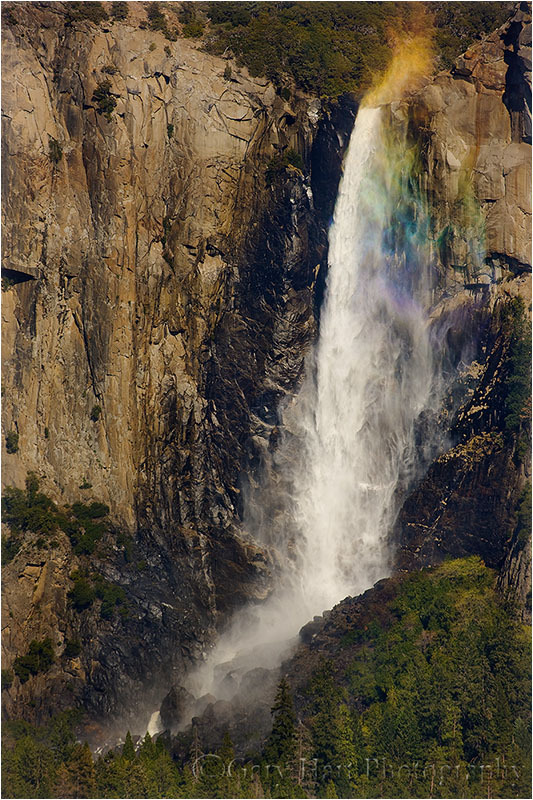 From Yosemite’s Tunnel View each spring afternoon, a rainbow can be viewed at the base of Bridalveil Fall. As the sun drops, the rainbow climbs, taking about 30 minutes to complete its ascent. Understanding the optics of a rainbow has practical applications for photographers. Not only does it help you anticipate a rainbow before it happens, it also enables you to find rainbows in waterfalls. Unlike a rainbow caused by rain, which requires you to be in exactly the right position to capture the incongruous convergence of rainfall and sunshine, a waterfall rainbow can be predicted with clock-like precision—just add sunshine. Yosemite is my location of choice, but there’s probably a waterfall or two near you that will deliver. Just figure out when the waterfall gets direct sunlight early or late in the day, then put yourself somewhere on the line connecting the sun and the waterfall. And if you have an elevated vantage point, you’ll find that the sun doesn’t even need to be that low in the sky. Understanding rainbow optics can even help you locate rainbows that aren’t even visible to the naked eye. A “moonbow” (lunar rainbow) is a rarely witnessed and wonderful phenomenon that follows all the natural rules of a daylight rainbow. But instead of resulting from direct sunlight, a moonbow is caused by sunlight reflected by the moon. Moonlight isn’t bright enough to fully engage the cones in your eyes that reveal color, though in bright moonlight you can see the moonbow as an arcing monochrome band. But a camera on a sturdy tripod can use its virtually unlimited shutter duration to accumulate enough light to bring out a moonbow in full living color. Armed with this knowledge, all you need to do is put yourself in the right location at the right time. 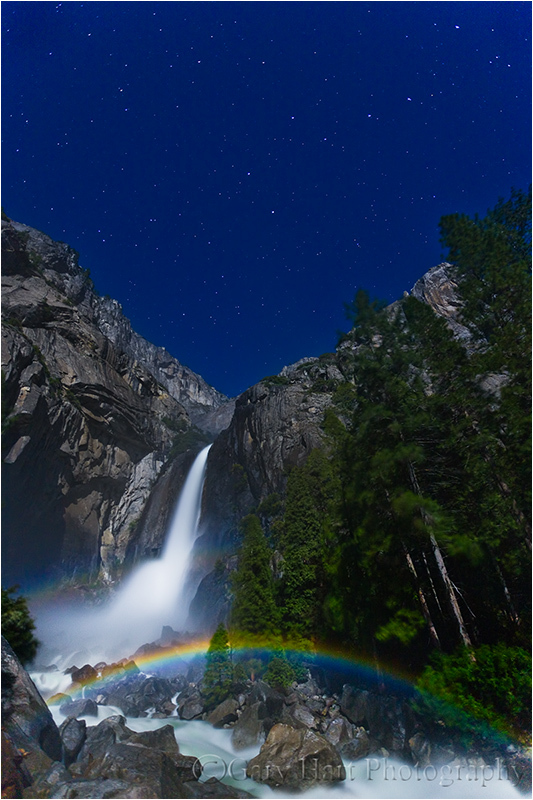 Moonbow and Big Dipper, Lower Yosemite Fall, Yosemite :: Each spring the full moon and Yosemite Falls conspire to deliver a breathtaking moonbow display. And as if that’s not enough, the Big Dipper is suspended above as if it’s the source of Yosemite Falls. 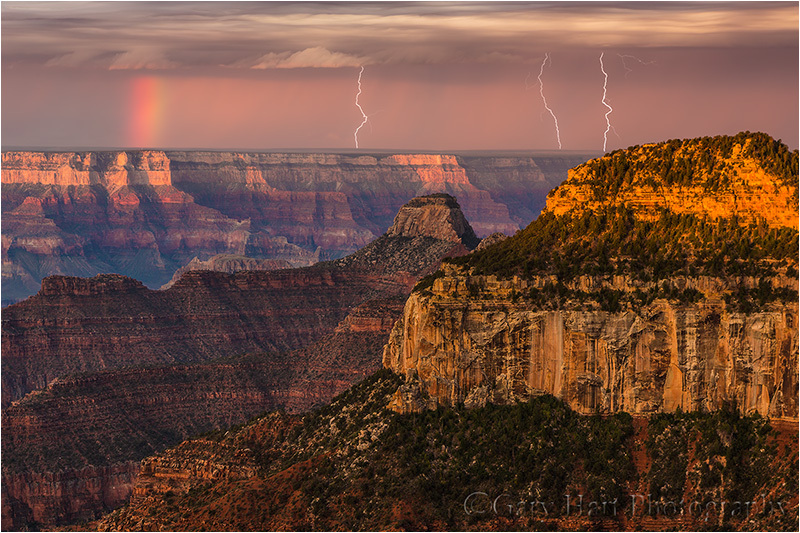 Rainbow, Lipan Point, Grand Canyon :: Sometimes the rainbow doesn’t appear exactly where you want it to. In a perfect world this rainbow would have connected the rims of the Grand Canyon, but there was no vantage point on the rim that gave me that view. Nevertheless, I was able to use the canyon’s red rock as a foreground, and balance its exquisite depth with the rainbow. Following a nice sunrise at the always beautiful Point Imperial, the Grand Canyon Monsoon photo workshop group spent two hours near Bright Angel Point photographing a spectacular electrical storm that delivered multiple lightning captures to everyone in the group. When the storm moved too close and drove us to safety (we’re resilient and adventuresome, not stupid), it would have been easy call it a day and tally our bounty. I mean, who likes getting rained on? Photographers, that’s who. Don Smith and I herded our group into the cars and headed to Cape Royal Road, where we could follow the Grand Canyon’s East Rim above Marble Canyon all the way to Cape Royal. Knowing that monsoon showers are fairly localized, the plan was to drive out of the cell that was dumping on us at the lodge and either shoot back at it, or (more likely) find another cell firing out over the canyon. In the back of my mind though was the hope for a rainbow above the canyon—dropping in the west, the sun was perfectly positioned for rainbows in the east. The rainbow appeared just after we passed the Point Imperial Road junction, arcing high above the forest. Climbing through the trees toward the rim (and its views of Marble Canyon), my urgency intensified with the rainbow’s vivid color, but we were stuck behind a meandering tourist who clearly had different priorities. As tempted as I was to pass him, I knew that would be a mistake with three more cars following me. So we poked along at a glacial pace. After what felt like hours, screeched to a halt at the Vista Encantada parking area with the rainbow hanging in there—I swear everyone was out of the car and scrambling for their gear before I came to a complete stop. With a full rainbow above an expansive view, I opted for my Sony 12-24 lens on my a7RII, but immediately began to question that choice. While Vista Encantada offers a very pretty view, it’s not my favorite scene to photograph because of the less-than-photogenic shrubbery in the foreground—a telephoto lens definitely would have worked better to eliminate the foreground, but I wanted more rainbow. So after a few failed attempts to find a composition at the conventional vista, I sprinted into the woods to find something better. This turned out to be a wise choice, as the shrubs here were replaced with (much more photogenic) mature evergreens. In a perfect world I’d have found an unobstructed view into the Grand Canyon, but as photographers know, the world is rarely perfect. Committed to my wide lens, I decided to use the nearby evergreens as my foreground, moving back just far enough for the rainbow to clear their crowns. Composing wide enough to include the trees top-to-bottom also allowed me to include all of the rainbow—suddenly my 12-24 lens choice was genius! After finishing at Vista Encantada we continued down the road and photographed another rainbow from Roosevelt Point, then wrapped up the day with a sunset for the ages at Cape Royal. A great day indeed, all thanks to monsoon weather that would have kept most tourists indoors. We all know photographers who have no qualms about staging their scenes to suit their personal aesthetics. The rights and wrongs of that are an ongoing debate I won’t get into, other than to say that I have no problem when photographers arrange their scenes openly, with no intent to deceive. But photography must be a source of pleasure, and my own photographic pleasure derives from discovering and revealing nature, not manufacturing it. I don’t like arranging scenes because I have no illusions that I can improve nature’s order, and am confident that there’s enough naturally occurring beauty to keep me occupied for the rest of my life. As far as I’m concerned, nature is inherently ordered. In fact, in the grand scheme, “nature” and “order” are synonyms. But humans go to such lengths to control, contain, and manage the natural world that we’ve created a label for our failure to control nature: Chaos. Despite its negative connotation, what humans perceive as “chaos” is actually just a manifestation of the universe’s inexorable push toward natural order. Imagine all humans leave Earth for a scenic tour of the Milky Way. While we’re gone, no lawns are mowed, no buildings maintained, no fires extinguished, no floods controlled, no Starbucks built. Let’s say we return in 100 Earth years*. While the state of things would no doubt be perceived as chaotic, the reality is that our planet would in fact be closer to its natural state. And the longer we’re away, the more human-imposed “order” would be replaced by natural order. What does all this have to do with raindrops on a poppy? Venturing outdoors with a camera and the mindset that nature is inherently ordered makes me feel like a treasure hunter—I know the treasure is there, I just have to find it. Patterns and relationships hidden by human interference and the din of 360 degree multi-sensory input, further obscured by human bias, snap into coherence when I find the right perspective. Finding water droplets to photograph can be as simple as picking a subject and squirting it with a spray bottle of water or (better still) glycerin. But what fun is that? If I’d have been staging this, I probably would have insisted on an open poppy, maybe with more and bigger drops. But that’s not what Nature gave me this soggy afternoon. So I photographed this raindrop festooned poppy (and many others) the old fashioned way—within minutes I was as wet as the poppy, and (to quote the immortal Cosmo Kramer) lovin’ every minute of it. Every year for the last 10 (or so) years I’ve traveled to the Grand Canyon during the Southwest summer monsoon to photograph lightning. Not only have I captured hundreds of lightning strikes and lived to tell about it (yay), I’ve learned a lot. A couple of years ago I added an article sharing my insights on photographing lightning to my photo tips section. With lightning season upon (or almost upon) us here in the United States, I’ve updated my article with new images and additional info. You can still find the article (with updates) in my Photo Tips section, but I’m re-posting it here in my regular blog feed as well. Read the story of this image at the bottom of this post, just above the gallery of lightning images. Let’s start with the given that lightning is dangerous, and if “safety first” is a criterion for intelligence, photographers are stupid. So combining photographers and lightning is a recipe for disaster. Okay, seriously, because lightning is both dangerous and unpredictable, before attempting anything that requires you to be outside during an electrical storm, it behooves you to do your homework. And the more you understand lightning, how to avoid it and stay safe in its presence, the greater your odds of living to take more pictures. Not only will understanding lightning improve your safety, a healthy respect for lightning’s fickle power will also help you anticipate and photograph lightning. Lightning is an electrostatic discharge that equalizes the negative/positive polarization between two objects. In fact, when you get shocked touching a doorknob, you’ve been struck by lightning. The cause of polarization during electrical storms isn’t completely understood, but it’s generally accepted that the extreme vertical convective air motion (convection is up/down circular flow caused when less-dense warm air rises, becomes more dense as it cools with elevation, and ultimately becomes cool/dense enough to fall. Convection is also what causes bubbling in boiling water. Convection in a thunderstorm carries positively charged molecules upward and negatively charged molecules downward. Because opposite charges attract each other, the extreme polarization (positive charge at the top of the cloud, negative charge near the ground) is quickly (and violently) equalized: lightning. With lightning comes thunder, the sound of air expanding explosively when heated by a 50,000 degree jolt of electricy. The visual component of the lightning bolt that caused the thunder travels to you at the speed of light, over 186,000 miles per second (virtually instantaneous regardless of your distance on Earth). But lightning’s aural component, thunder, only travels at the speed of sound, a little more than 750 miles per hour—a million times slower than light. Knowing that the thunder occurred at the same time as the lightning flash, and how fast both travel, we can compute the approximate distance of the lightning strike. At 750 miles per hour, thunder will travel about a mile in about five seconds: Dividing the time between the lightning’s flash and the thunder’s crash by five gives you the lightning’s distance in miles; divide the interval by three for the distance in kilometers. If five seconds pass between the lightning and the thunder, the lightning struck about one mile away; fifteen seconds elapsed means it’s about three miles away. The 30 (or so) people killed by lightning in the United States each year had one thing in common with the rest of us: they didn’t believe they’d be struck by lightning when they started whatever it was they were doing when they were struck. The only sure way to be safe in an electrical storm is to be in a fully enclosed structure or metal-framed vehicle, away from open windows, plumbing, wiring, and electronics. While there’s no completely safe way to photograph lightning, it doesn’t hurt to improve your odds of surviving to enjoy the fruits of your labor. (Unfortunately, photographing lightning usually requires being outside.) Most lightning strikes within a six mile radius of the previous strike. So, if less than thirty seconds elapses between the flash and bang, you’re too close. And since “most” doesn’t mean “all,” it’s even better to allow a little margin for error. Thunder isn’t usually audible beyond ten miles—if you can hear the thunder, it’s safe to assume that you’re in lightning range. Photographing lightning at night is mostly a matter of pointing your camera in the right direction with a multi-second shutter speed and hoping the lightning fires while your shutter’s open—pretty straightforward. Photographing daylight lightning is a little more problematic. It’s usually over before you can react, so without a lightning sensor to recognize lightning and click your shutter, success is largely dumb luck (few people are quick enough see it and click). And using a neutral density filter to stretch the exposure time out to 20 or 30 seconds sounds great in theory, but a lightning bolt with a life measured in milliseconds, captured in an exposure measured in multiple seconds, will almost certainly lack the contrast necessary to be be even slightly visible. Most lightning sensors (all?) attach to your camera’s hot shoe and connect via a special cable to the camera’s remote-release port. When engaged, the sensor fires the shutter (virtually) immediately upon detecting lightning, whether or not the lightning is visible to the eye or camera. With many lightning sensors from which to choose, before I bought my first one I did lots of research. I ended up choosing the sensor that was the consensus choice among photographers I know and trust: Lightning Trigger from Stepping Stone Products in Dolores, CO. At around $350 (including the cable), the Lightning Trigger is not the cheapest option, but after many leading lightning-oriented photo workshops, I can say with lots of confidence that lightning sensors are not generic products, and the internal technology matters a lot. Base on my own results and observations, the Lightning Trigger is the only one I’d use and recommend (I get no kickback for this). On the other hand, if you already have a lightning sensor you’re happy with, there’s no reason to switch. I won’t get into lots of specifics about how to set up the Lightning Trigger because it’s simple and covered fairly well in the included documentation. But you should know that of the things that sets the Lightning Trigger apart from many others is its ability to put your camera in the “shutter half pressed” mode, which greatly reduces shutter lag (see below). But that also means that connecting the Trigger will probably disable your LCD replay, so you won’t be able to review your captures without disconnecting—a simple but sometimes inconvenient task. You also probably won’t be able to adjust your exposure with the Lightning Trigger connected. The Lightning Trigger documentation promises at least a 20 mile range, and after many years using mine at the Grand Canyon, I’ve seen nothing that causes me to question that. It also says you can expect the sensor to fire at lightning that’s not necessarily in front of you, or lightning you can’t see at all, which I will definitely confirm. For every click with lightning in my camera’s field of view, I get many clicks caused by lightning I didn’t see, or that were outside my camera’s field of view. But when visible lightning does fire somewhere in my composition, I estimate that the Lightning Trigger clicked the shutter at least 95 percent of the time (that is, even though I got lots of false positives, the Lightning Trigger missed very few bolts it should have detected). Of these successful clicks, I actually captured lightning in at least 2/3 of the frames. The misses are a function of the timing between lightning and camera—sometimes the lightning is just too fast for the camera’s shutter lag. In general, the more violent the storm, the greater the likelihood of bolts of longer duration, and multiple strokes that are easier to capture. And my success rate has increased significantly beyond 2/3 since switching from a Canon 5DIII to Sony mirrorless (more on this in the Shutter Lag section). The Lightning Trigger documentation recommends shutter speeds between 1/4 and 1/20 second—shutter speeds faster than 1/20 second risk completing the exposure before all of the secondary strokes fire; slower shutter speeds tend to wash out the lightning. To achieve daylight shutter speeds between 1/4 and 1/20 second, I use a polarizer, with my camera at ISO 50 and aperture at f/16 (and sometimes smaller). Of course exposure values will vary with the amount of light available, and you may not need such extreme settings when shooting into an extremely dark sky. The two stops of light lost to a polarizer helps a lot, and 4- or 6-stop neutral density filter is even better with fairly bright skies (but if you’re using a neutral density filter, try to avoid shutter speeds longer than 1/4 second). Camera model: It’s surprising how much shutter lag can vary from manufacturer to manufacturer and model to model. In a perfect world, for lightning photography your camera’s shutter lag will be 60 milliseconds (.006 seconds) or faster (the lower the number the better), but 120 milliseconds (.012 seconds) or faster can give you some success. The top cameras from Sony, Nikon, and Canon are all fast enough, but the latest Sonys are the definite shutter lag winner (fastest), with Nikon a not too distant second, and Canon third. And shutter lag can vary with the manufacturer’s model: While my Sony a7RII is one of the fastest cameras out there, my a7R was unusably slow, so you need to check your model. Since I don’t check every camera released, it’s possible this ranking will change well before I update this article, so I recommend that you research shutter lag for your camera model. Unfortunately, shutter lag isn’t usually in the manufacturers specifications, so it’s hard to find. The best source I’ve found is the “Pre-focused” time in the Performance tab of the camera reviews at Imaging Resource. Camera settings: Basically, to minimize the “thinking” the camera needs to before firing, you want to be in manual everything mode—metering and focus. If your camera offers an electronic front curtain option (as my Sonys do), use it. If you must autofocus, go ahead and do it each time you recompose, then turn autofocus off as soon as you’re focused. Though the Lightning Trigger documentation suggests Aperture Priority metering, I use and recommend Manual metering mode to eliminate any camera-slowing metering (but Aperture Priority is fine if you have a strong preference). And, also despite what the Lightning Trigger documentation suggests, noise reduction is a post-capture function that might slightly delay continuous frames, but it won’t increase shutter lag. The wider your composition, the greater your odds of capturing lightning, but the smaller the lightning will appear in your image. Identify the most likely lightning cell and find the best composition that includes it. I tend to start with wider compositions to ensure success, then tighten my composition once I’m fairly confident I captured something. Note the height from which the lightning originates and be sure to include enough cloud to get all of the stroke. On the other hand, don’t include too much room above the lightning—the most frequent rookie mistake I see is too much sky/clouds in the frame. The second most frequent is lightning cut off at the top. Unless the storm is too close for safety, for any given cell, most lightning will originate from about the same height above the ground. The best lens is usually a midrange zoom such as a 24-70 or 24-105—if you find yourself reaching for the 16-35 (or wider), you’re too close. On the other hand, once you’re sure you’ve captured some good strikes, try putting on a 70-200. The narrow field of view can significantly reduce the number of frames with lightning, but the ones you get will be much larger in the frame and therefore more spectacular. Don’t forget to try some vertical compositions. I usually wait until after I know I’ve captured some in a horizontal frame because vertical narrows the horizontal field of view and lowers the odds of success a little. Lightning stands out better in a slightly underexposed image. My target shutter speed is usually 1/8 second (slow enough to include multiple pulses, but not so slow that I risk washing out the lightning). When the sky is relatively bright, dropping to 1/15 or even 1/20 second can make the lightning stand out better than 1/8 (but risks losing secondary strikes). Conversely, when the sky is extremely dark and the lightning is firing like crazy, extending to 1/4 second might increase your chances for multiple pulses. Just because you’re standing around waiting for things to happen, doesn’t mean there’s nothing to do. Keep your eyes glued to the sky and adjust your composition as the lightning shifts, or as new activity starts elsewhere. If you wait until you hear your shutter click or someone else exclaim before looking up, you won’t see the lightning. And monitor the light—your exposure can change by several stops as the storm moves, intensifies, or winds down. Try not to check your captures on your LCD until you’re done (or better yet, until you upload your images to your computer). With the Lightning Trigger (and some other sensors), viewing the LCD requires turning off the sensor, which risks missing a shot (I’m pretty sure lightning waits for me to turn off my sensor), and you’ll also find that many successful captures, especially wide compositions with a relatively bright sky, just aren’t that visible on an LCD viewed in daylight anyway. Be aware that electrical storms can move quite quickly, so you need to monitor them closely. Sometimes this simply means adjusting your composition to account for shifting lightning; other times it means retreating to the car if the cell threatens your location. No shot is worth your life. On the first evening of last year’s second Grand Canyon Monsoon photo workshop, Don Smith and I took the group to Point Imperial for a sunset shoot. Based on the forecast we had little hope for lightning, but one thing I’ve learned over the many years of photographing the monsoon here is that the forecast isn’t the final word. We got another reminder of this that evening. The view from Point Imperial is both expansive and different from other Grand Canyon vistas, stretching east across the Painted Desert and north to the Vermillion Cliffs. As the group made their way down to the vista platform, in the corner of my I thought I a lighting strike far to the north. A second bolt confirmed my discovery and soon we had the entire group lined up with cameras pointed and triggers ready. With everyone in business, I set up my tripod and attached my Lightning Trigger to my Sony a7RIII. Since this lightning was close to 30 miles away, maybe farther than any lightning I’ve tried to photograph, so I hauled out my Sony 100-400 GM lens and zoomed in as tight as I could. I didn’t have to wait long to confirm that my Lightning Trigger would catch strikes this distant—it didn’t hurt that these were massive bolts, many with multiple pulses and forks. Everyone was thrilled, so thrilled that it didn’t immediately register that the storm was moving our direction. I started at 400mm, but by the time I captured this frame I was just a little more than 100mm. That’s still a pretty safe distance, but with night almost on us and another cell moving in from the east, we decided to take our winnings and go home. One final note: If you check my exposure settings, you’ll see that my shutter speed here was .4 seconds, well outside the 1/20-1/4 second range I suggest. But if you look at the other settings, you’ll see that I’d opened up to f/7.1, and had cranked my ISO to 400, an indication that twilight was settling in. Successful lightning photograph is all about contrast, and the darker the sky, the better the bolt stands out, even in a longer exposure. Had we stayed past dark (and lived), we could have jettisoned the Lighting Triggers and used multi-second exposures. 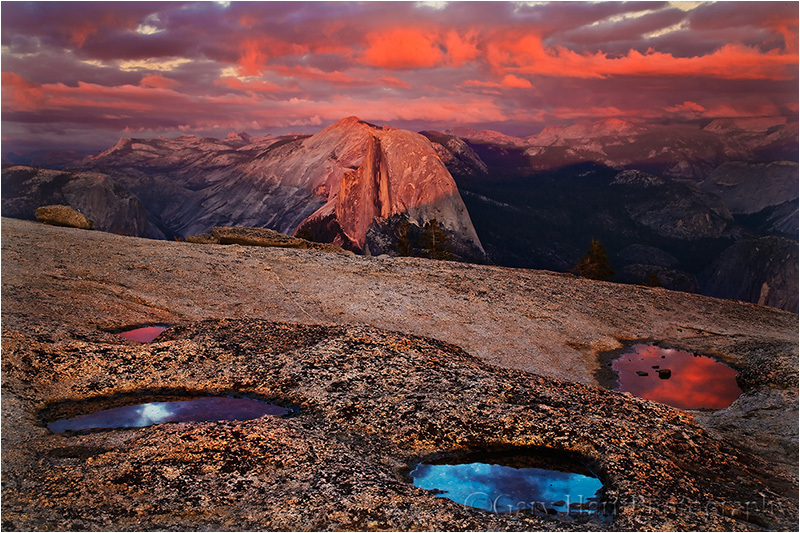 I’ve been to Valley View in Yosemite about a million times. For those not familiar with Yosemite Valley, Valley View (sometimes called Gates of the Valley) is the classic view of El Capitan, Cathedral Rocks, and Bridalveil Fall, with the Merced River in the foreground, that represents Yosemite in countless calendars, postcards, and advertisements. Though all this attention is justified, after a million visits and counting (okay, so maybe I’m exaggerating just a little), you’d think it would be easy to take Valley View’s beauty for granted. But I don’t get tired of visiting here, not ever. 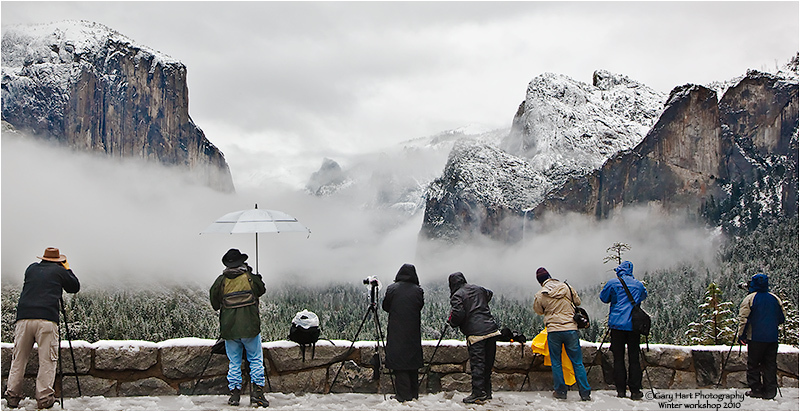 Like most spots in Yosemite, the scene at Valley View varies greatly with the season and weather. In spring, Bridalveil Fall explodes from beneath Cathedral Rocks, and the surrounding forest is dotted with blooming dogwood. In autumn, rocks dot the Merced River, and colorful leaves mingle with glassy reflections. And on still winter mornings, a low mist hugs Bridalveil Meadow just across the river, while churning clouds surrounding El Capitan after a storm are a sight to behold. Nevertheless, I’m often content to keep my camera in the bag and just privately appreciate Valley View’s majesty. But I’m a photographer, and sometimes it’s hard to experience this beauty passively. On those visits when I’m moved to photograph Valley View, I challenge myself to find something that hasn’t been done a million times. The final morning of last week’s Yosemite Moonbow and Wildflowers photo workshop was gray and damp, with occasional sprinkles lingering from a heavier overnight rain. We’d been here earlier in the workshop (in different conditions), and I hadn’t planned to photograph this time, but spotting raindrops clinging to the branches of the shrubs that line the river, I recognized a unique opportunity. If you know optics, you know that a convex shape bends outward (so water striking its surface would run off; water striking a concave surface would pool inside). Due to this curvature, photons passing through a convex lens are diverted toward the center, where they converge and cross to create an inverted image at the point of convergence (focal point). In fact, the human eye is a convex lens, projecting its inverted image onto the back its sphere, an image your brain promptly reverses. And photographic lenses are a complex arrangement of convex lens elements that ultimately project onto your camera’s sensor an upside-down image that’s flipped for display by the camera’s firmware. Compared to these two examples, a dangling raindrop is elegant simplicity. Bound by surface tension, water molecules naturally form a spherical shape that is flattened or stretched slightly by gravity. Because water molecules form an electrostatic bond with foreign surfaces as well, they also adhere to things like leaves and branches, sometimes appearing to defy gravity. This small gift from nature turns a raindrop into a natural convex lens. Courtesy of this natural lens, those who peer closely into a water drop will see an inverted microcosm of the surrounding world, a view that changes with the viewing angle. There’s potential beauty inside every water drop, but on this morning at Valley View I was in the fortuitous position to photograph raindrops holding one of the most beautiful scenes on Earth. I found a quintet of raindrops lining a branch that had nothing behind it but river. Tiptoeing close, I aligned myself and the raindrops with the Valley View scene and extended my tripod to branch level. I started with my Sony 90mm on my Sony a7RIII, adding extension tubes to get even closer. After working with this combination for a few minutes, I switched to my Sony 100-400 GM (still with extension tubes). The image you see here is from the 100-400. Depth of field with such a close focus point is paper thin, so I stopped down to f/20 and bumped I my ISO to 3200 to ensure a shutter speed fast enough to minimize the risk of motion blur. To focus, I magnified the raindrop scene in my mirrorless viewfinder. Exposing to avoid blowing out the bright highlights in the (inverted) sky also darkened the river, creating the ideal background.